While I was saving to move to Los Angeles I didn’t shop, like, at all. It was really rough because I LOVE me some shopping. But since I just landed a great freelance copywriting gig for Marika & Zobha, I figured the most patriotic way to spend the Fourth of July would be to contribute to our great nation’s GDP at Our Lady of Forever 21! Since I got rid of most of my clothes, I didn’t have anything blue or red to wear to the Fourth of July BBQ in Silver Lake. 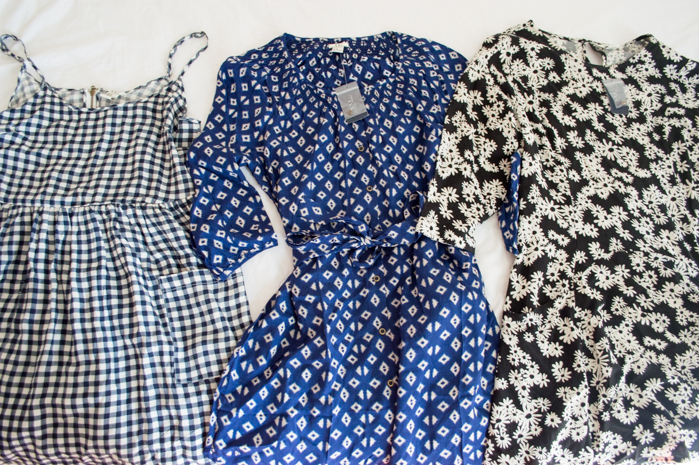 I also didn’t have very many cute, non-slobby clothes to wear to my new writing assignment, so I picked up these dresses at Forever 21. I wore the gingham dress on Saturday night, and I just love it because it reminds me of Dorothy’s dress in The Wizard of Oz! Also, just sidenote: people bring their dogs everywhere in LA and no one cares at all. I almost stepped on some lady’s Pomeranian at Forever 21. And I KNOW that thing wasn’t a service dog (though it sure was cute!). 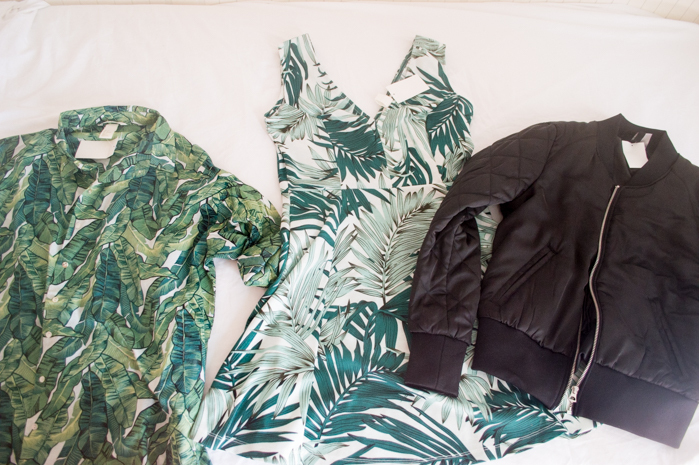 I also went a little crazy with the palm print at H&M. The shirt on the left is totally Hunter S. Thompson, but it’s amazing and I actually nabbed the last one in the store. The palm dress was only $4 and it fits great. Then I picked up a black satin bomber, because it actually gets pretty chilly at night in LA and I needed another jacket option. I also got some new accessories! The Ohio necklace was actually a gift from my friend Alicia, who gave one to me and Carolyn before our move! I also picked up a bandana headband from H&M (for the Fourth of July duh! 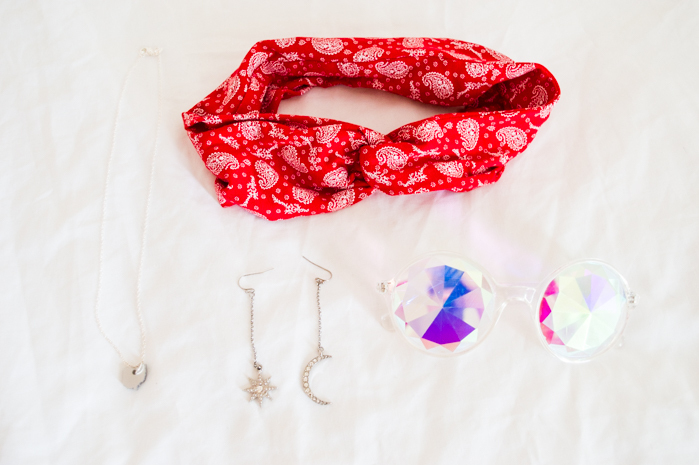 ), star & moon earrings, and then these awesome party glasses from Hidden Treasures! I can’t see in them but who cares when you look so awesome? So, yeah, it felt amazing to go on a little Spender Bender and I actually didn’t spend TOO much money. I mean, it’s hard to spend very much when you shop at Forever 21 and H&M. Have you guys made any great purchases lately? Let me know in the comments!